Last week in Madrid, AMEC (International Association for the Measurement and Evaluation of Communications) held their 5th European Summit on Measurement. This one was entitled, Unlocking Business Performance – Communications research and analytics in action. One underlying premise of the program this year was that the time for talk is behind us and the time for action and putting into place the principles and practices of sound measurement is upon us. The later part of the program featured an update from Salience Insight Commercial Director Mike Daniels on social media standards including the recently published standardization effort from the cross-industry group called The Conclave which may be found here. Once Mike discussed where we are with respect to standardization, Richard Bagnall (@richardbagnall), Chairman of the AMEC Social Media Measurement Group, and I as his vice-chair, presented a session on creating a new recommended framework for social media metrics and measurement. Essentially we tried to answer the question: how do we take the standards work coming from The Conclave and operationalize it to create proper social media measurement? Here is an overview of what we presented and what we are encouraging everyone to adopt and use. The framework templates, usage guide and a short video synopsis will be available for download from the AMEC website, Social Media Measurement section, in the next week or so. Our journey begins with the Valid Metrics Framework, a measurement planning framework and template developed under the auspices of AMEC. The framework was designed to be flexible enough to address multiple aspects of public relations within a consistent measurement framework and approach. Helps create a focus on outcomes. One of the applications of the Valid Metrics Framework was for use with social media programs. Two potential issues were surfaced by early adopters of the framework in social programs. The intermediary effect, which in traditional public relations is the impact on the media, seemed at odds with the social world of direct interaction between consumers and brands, and consumers with each other. And use of the marketing sales funnel, while familiar, was only relevant in a percentage of social media use cases and perhaps not the best way to model common uses of social media like customer relations and building relationships with stakeholder groups. Also, thought leaders like Forrester Research and McKinsey & Company had noted the traditional communications funnel was not necessarily funnel-shaped in social media. They described the discovery process that occurs when investigating companies and brands that often cause the consideration set to expand rather than be reduced, and the fact that a lot of engagement around brands happens post-conversion event. For all of these reasons our task was develop and recommend a better framework and approach. When we use the word model, we are referring to a representation of a system, in this case social media. 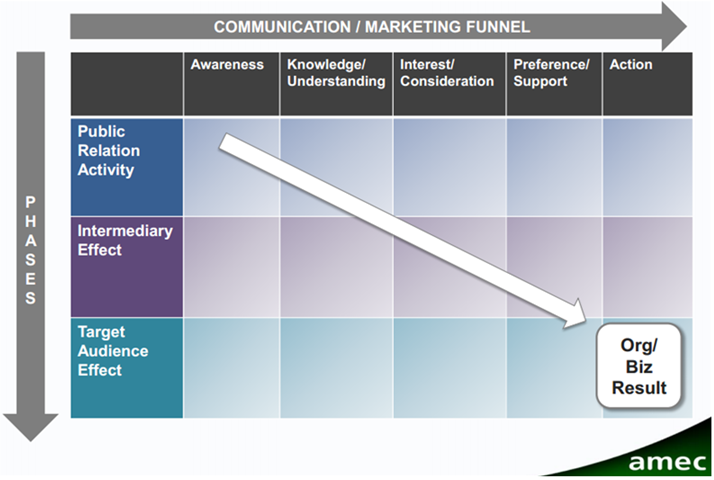 In the original Valid Metrics Framework, the model used was the traditional sales funnel. A framework adds additional dimensions to the model and is operationalized with metrics. In the Valid Metrics Framework the additional dimensions are the phases – activities, intermediary effects and target audience effects. We looked at both of these aspects individually and collectively when considering alternative approaches. We studied and evaluated about fifteen different social media and communications models. A couple of common patterns emerged. Several of the models, including Forrester’s Customer Lifecycle and McKinsey’s Customer Journey showed a post-purchase engagement/experience step. We judged this important to include in our recommended approach. And we considered the importance of Engagement and Influence, as two key concepts in social media marketing and measurement, and decided to try to make these two elements explicit in our model as well. The model we developed is derivative of the categories chosen by The Conclave (Note: Richard Bagnall and I also participate in The Conclave) to organize social media metrics and definitions. We took a slightly different perspective on the front end of the model and reordered the back-end to create this model for our new framework. The descriptions of the stages use the definitions from the smmstandrards.org work wherever possible. You will note Engagement includes both interactions with owned social channels as well as earned social conversation of people ‘talking about you’ in social channels. The definition of Influence is clear and concise, the result of a lot of discussion and prevailing clear thinking. The concept of Impact includes the outcomes of social initiatives as well as the Value those initiatives created. (I usually advise to always attempt to measure impact, and attribute value when it is feasible and makes sense.) Advocacy includes a very helpful definition and conditions that exist with advocacy. Use a simple structure that captures social media metrics from three key perspectives – programmatic-level, channel-specific and business. Programmatic metrics are those directly tied to social media objectives. Channel-specific metrics are just that, the metrics that are unique to specific social channels – tweets, RTs, Followers, Likes, Talking About This, Pins, Re-Pins. Business metrics are used to show the business impact of the campaign or initiative. There are certainly other ways to think about this (e.g. Business Performance Management) and we intend to possibly add others based on industry feedback and suggestions. Currently we have developed both versions with sample metrics (taken from the smmstandards.org work where applicable). We are calling them The AMEC Social Media Valid Framework. Here is the version with Program, Channel and Business Metrics shown. Look for the completed frameworks on the AMEC website shortly. We encourage you to adopt the frameworks for use by your company or clients. If you like them and find them useful, please help promote them widely. And please provide your feedback on the proposed framework on this blog, or through the social channel of your choice. We’re listening and looking forward to the dialogue.